Lewis Hole has scored eight goals in Little Common's last three games. Lewis Hole scored a hat-trick for the second successive Saturday as Little Common Football Club achieved its third 5-0 victory of the season. Wes Tate and Sam Ellis were also on target as the Commoners triumphed away to Midhurst & Easebourne in Macron Store Southern Combination Football League Division One. 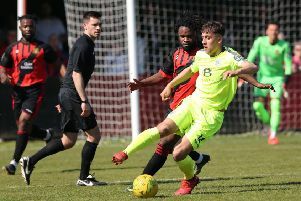 Common made the long trip west without Jamie Crone, Dom Bristow or James Maynard, but gave a debut to Jamie Fielding in the back four, with Rosh Wells and Dan Ryan completing the starting line-up. Common started sluggishly on a notoriously difficult sloping pitch and could have been 2-0 behind after just 10 minutes. Midhurst spurned a glorious chance to open the scoring after being awarded penalty when Fielding and Matt Cruttwell were penalised for sandwiching the home forward on the edge of the area. The resultant spot-kick rattled the crossbar before being cleared to safety. Moments later the hosts threatened again when they broke down the right and a curling effort hit the post before rebounding into Cruttwell’s arms. Common soon settled and began to dominate play, Ellis driving an effort just wide before being unable to get his shot away at the end of a mazy run into the area. The opening goal arrived in the 16th minute. A neat interchange on the edge of the area led to Tate waltzing into the box before calmly slotting beyond the home goalkeeper. Adam Smith’s shot skimmed the outside of the post before a Russell Eldridge free kick was easily gathered by the goalkeeper. At the other end, Cruttwell was forced into two routine low saves and the score remained 1-0 at half time. Common began the second half with a lot more intensity as they kicked down the slope and it was no surprise when the scoreline was doubled in 50th minute. Hole latched on to Eldridge’s pass before lifting the ball over the onrushing goalkeeper. Eight minutes later and it was 3-0 as Ellis shrugged off his marker and fired into the net. Ellis was also involved in the fourth goal. His initial shot was blocked before Nick Richardson laid the ball to Hole, who turned and curled an effort into the top corner from the edge of the area. Midhurst came close to a goal when Cruttwell tipped a shot onto the crossbar before Hole completed his treble 15 minutes from time. Richardson’s shot was saved, but Hole followed up to tap in his 10th goal already this season. Common could have added to their tally in the final minutes, but Hole saw an effort saved after rounding the goalkeeper and Jared Lusted looped a header over the crossbar. Common: Cruttwell, Walker, Ryan (McEniry), Ward, Fielding, Eldridge, Wells (Lusted), Tate, Hole, Ellis, Smith (Richardson). Standings (played five matches unless stated): 1 Selsey 15pts, 2 Wick 15, 3 LITTLE COMMON 13, 4 Langney Wanderers 10, 5 Seaford Town 10, 6 BEXHILL UNITED 8, 7 St Francis Rangers 8, 8 Mile Oak 7, 9 Steyning Town (4) 6, 10 Storrington 6, 11 Hailsham Town 5, 12 Oakwood (4) 5, 13 AFC Varndeanians 5, 14 Lingfield 4, 15 Midhurst & Easebourne 3, 16 Billingshurst 3, 17 Southwick 1, 18 Ringmer 0.